UAT™ Pure Pro seawater desalination membrane filtration systems from De Nora Water Technologies are ideal for offshore oil and gas applications. The standard output capacities range from 2,000 GPD to 26,000 GPD (7,570 LPD to 98,410 LPD) and effectively produce fresh treated potable water, free of particulate matter or contaminants from a seawater source. 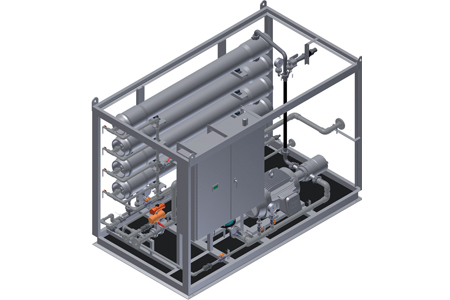 Higher output capacities and custom configurations are available on a project to project basis. The cost-effective, efficient and easy-to-operate UAT™ Pure Pro systems are built to withstand offshore and marine environments. The systems always provide a source of fresh water — whenever and wherever it’s needed. Systems feature corrosion resistant components, flexible control features in addition to standard features.